REBECCA EANES is the founder of Positive-Parents.org, creator of Positive Parenting: Toddlers and Beyond, and a contributing editor to Creative Child magazine. "With a belief that each parent knows their own child best and that raising children should be enjoyable, not stressful, Rebecca Eanes helps parents develop their own positive parenting blueprints to create happy, loving families. Positive Parenting helps parents work through the difficult feelings that naturally occur throughout the parenting journey and provides strategies to help raise positive thinkers." "As I soaked up the wisdom contained in this book, two words kept coming to mind: positive pathways. No matter how challenging your family situation is or how long you’ve been going down a negative road, this book offers pathways to peace, connection, and true happiness. Through practical examples, detailed steps, and soul-stirring questions, Rebecca Eanes shows us how to reach our fullest potential as parents, partners, and human beings. Let Positive Parenting set you on a path to rewriting your story in all aspects of life, in the most positive way possible." "In our always connected world of social media and Google searches there is a never-ending flow of “new and better” parenting information. It's easy to get lost in the sea of “best practices.” The focus is often on changing kids’ behavior or all the reasons you are ruining your kids. The problem is that so much of what we read seems to conflict and leaves us feeling powerless rather than truly supporting parents and families. 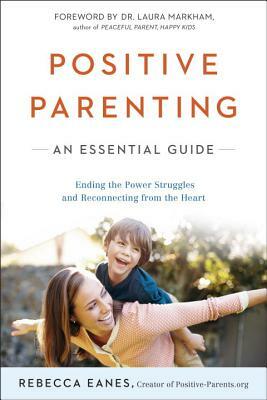 Rebecca's new book Positive Parenting emphasizes that parenting is far more than simply making kids comply. It's about real lives, relationships, and people; It's about real moms', dads' and kids' stories and how to make those stories incredible. This book gives the reader timeless, foundational principles and practices that help to build the parent, the child and the family as a whole from the inside out."